Roll-n-Go reserves the right to change design details, components and options at any time without notice. 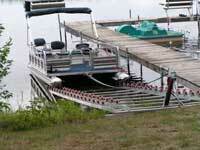 * Adjustable rail width for round pontoons spaced between 66" and 82" on center. 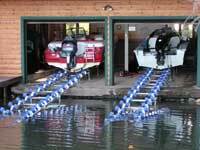 ** 2-year warrenty for salt water applications. *** Available with upgraded winch only. 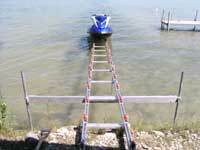 **** Customer may replace strap with up to 30 feet of 5/16' rope. "I have already recommended Dvorak's Docks at a lake party. Very good service, quick and quality work. You went the extra step for our blind son. Thanks." – Jim A.